Uwe Beckmeyer, Parliamentary Under Secretary of the Federal Minister for Economic Affairs and Energy, visited Rolls-Royce Power Systems AG in Friedrichshafen. Dr. Ulrich Dohle, company CEO who also chairs the MTU Friedrichshafen subsidiary, explained the low-emission diesel engines of the future. MTU is part of Rolls-Royce Power Systems within the Land & Sea division of Rolls-Royce. 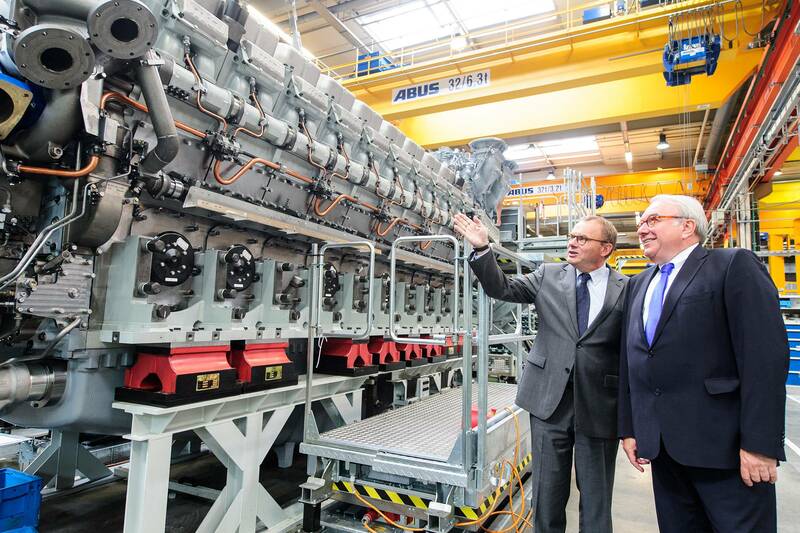 MTU's engine portfolio was presented to Under Secretary Beckmeyer in a tour of the Training Centre and Assembly Shop. Beckmeyer is the German government's coordinator for the maritime industry. Dr Ulrich Dohle said, “In the marine sector, we are intensifying efforts on innovative, eco-friendly solutions to further minimise emission levels and reduce the consumption of energy and raw materials.” This applies to the development of a gas engine for mobile use which, compared to a diesel engine, emits 25 percent less carbon dioxide, significantly reduced levels of NOx and no sulphur oxides whatsoever. Rolls-Royce Power Systems has invested 40 million Euros in a new development test facility intended for diesel and gas engine trials. This new testing facility was officially opened at the end of July. Parliamentary Under Secretary Uwe Beckmeyer added, “The maritime industry goes far beyond the coastal regions and the resident shipyards. In Central and Southern Germany main suppliers have been operating successfully for decades. The advanced technology and the know-how of companies from southern Germany contribute substantially to the export success of the maritime industry in Germany.” An internationally competitive maritime industry is of considerable importance to the overall economy. With its subsidiary MTU Friedrichshafen, Rolls-Royce Power Systems is a leading partner of the maritime industry. Rolls-Royce Power Systems itself generates 39 percent of its sales with marine business.